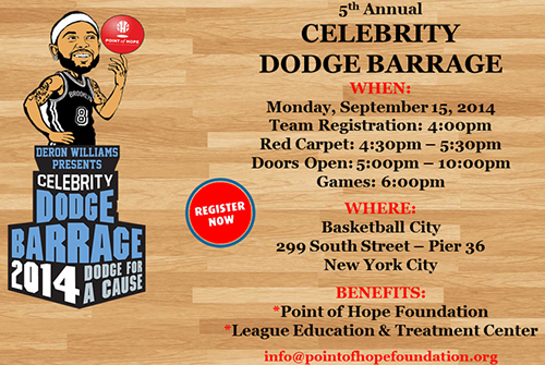 Deron Williams will host his 5th Annual Celebrity Dodge Barrage charity event on Monday, September 15, 2014, at Basketball City located at 299 South Street – Pier 36 in NYC. Registration will begin at 4:00pm and Red Carpet from 4:30pm – 5:30pm. Games will begin at 6:00pm. The Nets All-Star point guard’s signature fundraising event will feature a round-robin style dodgeball tournament, a VIP meet & greet lounge, a live and silent auction, great music by DJ Mode, top shelf open bar, a delicious array of food presented by Master Purveyors, Inc. and sweet treats by Konfections By Karrah and Jala. Confirmed attendees include NBA Stars Paul Millsap and Kyle Korver of the Atlanta Hawks, Wes Matthews of the Portland Trailblazers, NY Giants Super Bowl Champions Steve Weatherford and Howard Cross and Miss Universe 2012 Nana Meriwether, to name a few. Internationally Acclaimed Opera Sensation James Valenti will sing the National Anthem and CBS Anchor Chris Wragge will be the emcee. 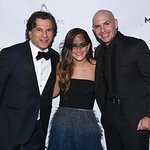 All proceeds from this highly anticipated event will benefit the Point of Hope Foundation and Brooklyn’s League Education and Treatment Center. “This is my favorite event and I think it’s a great event. It’s pretty affordable for everybody and it’s a great way to raise money. There are so many different causes and diseases and people who have problems that the Point of Hope is just about helping people, and kids, especially. I’m blessed to be able to give back,” said Deron Williams.